Today I have another "Wishlist Wednesday" post for you and today's wishlist is a fashion and beauty wishlist. 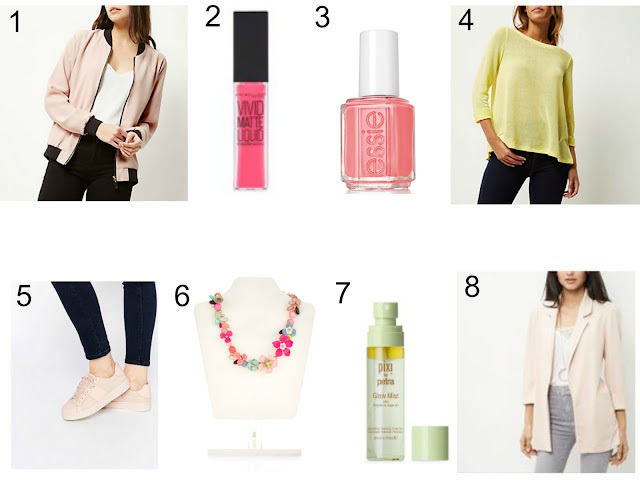 I have quite a few items to share with you today so without further ado, here's my fashion and beauty wishlist. 1. River Island Light Pink Bomber Jacket - Bomber jackets are everywhere at the moment with so many different colour variations available, I have seen some lovely Khaki and floral ones but this light pink one caught my eye immediately on the River Island website, I love this blush pink shade and think it would be perfect for spring/summer. 2. Maybelline Vivid Matte Liquid Lipstick in Coral Courage - £6.99 -I have been waiting for these to launch here in the UK for months so I was super excited when I spotted them online, I'm sure you know by now that coral is one of my favourite lip colours for the spring/summer and this looks perfect for me. I am going to be giving away a couple of these soon, so keep an eye out for that giveaway. 3. Essie Spring 2016 Lounge Lover - £8.99 - As soon as I saw the Essie 2016 spring collection I knew I would love Lounge Lover, it is right up my street and again coral which needs no explanation, I adore coral nails for the spring/summer, doesn't it look a lovely shade? 4. River Island Wrap Back Top - £22.00 - I have a top like this in a neon pink that I bought a couple of years ago from River Island and it still looks lovely, made from quite a thin material they look lovely with a cami under, this is slightly different from my neon one and has a wrap back detail, I would wear a white cami style vest top underneath and think it would look lovely with my skinny jeans, I'm just a bit unsure if the colour will clash with my blonde hair. 5. ASOS Drew Pink Trainers - £25.00 - I love these, I have some Adidas Superstar trainers and have seen some plain peachy/pink Adidas trainers which I featured on my Instagram page recently but they are expensive and I would only get the same amount of wear out of the ASOS ones which are a lot cheaper, I really like these and think they make a change from my ballet pumps for the spring/summer. 6. Accessorize Bethany Statement Necklace - £25.00 - If you have been reading my blog for some time you will know that I adore statement necklaces and during the spring/summer I wear them a lot, I think they can completely change an outfit and this one is beautiful, I love it, it's quite expensive so I think I will wait to see if there are any discount codes available before ordering. I have some other Accessorize statement necklaces that I have had for a couple of years and they have worn really well, so I assume this would too. 7. Pixi Glow Mist - £16.00 - I have heard really great things about the Pixi skin care and went on the hunt after reading the lovely Beautylymin blog post about Pixi skin care, when I saw the Glow Mist I thought it might be good for my super dry skin to use before applying my foundation as I'm having problems with how my foundation looks due to my skin being extremely dry at the moment, I have only ever tried the Pixi Glow Tonic but there are so many other skin care products I'd love to try from Pixi. 8. New Look Shell Pink 3/4 Length Sleeve Blazer - £27.00 I love this blazer and the pale pink shade too, it is also available in pastel blue, black and cream if the pink isn't your thing, I always end up pushing blazer sleeves up so the 3/4 length sleeves are perfect for me, I like the waffle texture too and think it would look lovely with a white vest top, skinny jeans and that Accessorize statement necklace too. I'm finding spring/summer jackets difficult to find and as I really need some new ones, I think this would be lovely. So those are all the items in my wishlist, which item is your favourite? Are there any items you would like to pick up for yourself? Let me know in the comments, I would love to know your thoughts.